My vintage power supply from Japan did not have short-circuit protection. I couldn't deal with this, as the brass models were also ancient and shorting out all over the shop. A little googling presented me with Homemade Circuit Projects: Short Circuit Protection. This article has a nice 'mechanical' short-circuit protector. A relay is energised to begin the power output and, on short, is tripped, cutting the supply. There are no integrated circuits whatsoever inside this power supply, so I thought I'd go the mechanical way. 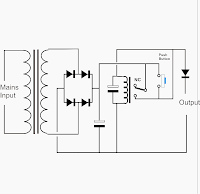 A relay is used to allow power from the source to the output. This relay is initially de-energised. The momentary push-button, when activated, will provide power across the coil in the relay, energising it. There is a secondary feed to the relay's coil which goes via its switched output. As the relay switches, this secondary power is activated and the current then also flows across the coil. This provides a sort of infinite loop where the power through the relay contacts infact keeps the relay energised. A short on the output causes a drop in voltage. This voltage is required to keep the relay energised, so a drop will actually de-energise the relay and cut the output power. The push-button will need to be activated once more to re-energise the relay. 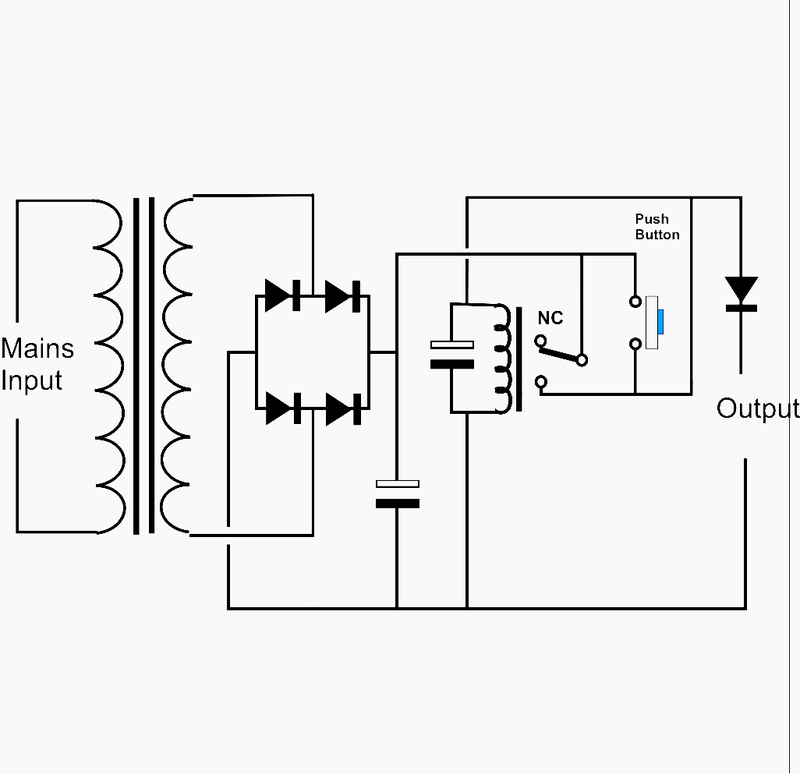 This circuit needs to be placed after the bridge rectifier as it requires DC power. It also needs to be placed prior to the direction switch, as the polarity needs to be constant and one-way around. This leaves us with the choice of putting it before or after the throttle potentiometer. I had originally placed it between the rectifier and the potentiometer. I wanted the continuous voltage, otherwise I'd only be able to energise once the throttle was more than zero. Unfortunately, in this position I found that it only tripped when the throttle was at maximum. It seemed that the potentiometer was capable of absorbing the short if any resistance was provided. Prolonged exposure to a short would no-doubt heat the coil of the potentiometer and cook it. Moving it to the other side of the throttle worked perfectly. Even at throttle setting '1' it would trip. Of course, it would only energise when on throttle '1' or higher. I considered adding more components to allow a secondary source to trigger the relay, but found that I could adjust my usage of the power pack. Now when wanting to drive trains, one must shift to low throttle, hit the trip switch and then throttle further. Based on the diagram above, you'll need 2 100uf electrolytic capacitors at 16v or higher, a diode capable of the amperage/voltage, and a relay. The relay should be DPDT if you also want the status light. As above, you can twist the diodes together in parallel to make them suffer higher currents. I used 1A diodes and wanted to make sure they could cope with the 2A transformer... but then I got bored and twisted 4 of them together. You can then see my prototype hookup to see if it all worked. I wanted to know when the switch was in trip mode. I didn't want to have to pull my multimeter out each time to work out where a fault was when no power was available. To do this, I used the second side of the relay to provide a 12v source to the led inside the momentary switch. This would light in the normally-closed position. As mentioned above, the relay only provided output power when energised (Normally-Open), so I wanted the light on the NC side so as to illuminate when the power was cut off. The switch indicated that it was rated at 12-volt and 240v. I took this to mean the internal lamp/LED? was 12v and the contacts could switch 240v. I didn't want to risk it though, so I put a 470ohm relay in series to limit the current. The resulting brightness worked perfectly well. Adding the switch wasn't going to be easy. The nicest one I could find had a huge barrel. I used the smallest drill-bit I could find and then proceeded up. I hate cutting in to metal... always worried something will go flying and take a limb off. The metal shavings aren't much fun either. Fortunately my friend has a dremel... so we hacked away with that and made the switch fit. The best location was on the front panel. I do like the finish. It works perfectly. Setting the throttle to '1' or higher lights the switch... it always starts in trip mode and needs to be activated. Pressing the button switches modes and the relay clicks. The LED switches off and, depending on the position of the direction switch (and the power requirements of the locomotive on the track) the locomotive will start to move. In fact, it shorted as soon as I tried to apply power to my ED100 on the test track. Turns out an axle had dislodged from its mount hole in the bogie frame and was happily shorting. After a realignment, all worked well. The bogies on these Tenshodo/KTM models have quite a bit of flex. The lateral screw isn't 100% tight and so the bogie frames can skew.